BIOPLASTIC: Portable speakers made from non-recyclable plastic waste. Brighton-based design studio Gomi has created a portable bluetooth speaker using plastic waste that is deemed non-recyclable by local councils in the UK. According to an article on Dezeen.com each Gomi speaker features a rectangular body formed from colourful marble-effect plastic. The equivalent of 100 plastic bags in non-recyclable – or flexible – plastic go into the body of each speaker. Flexible plastic includes materials such as plastic bags and bubble wrap made of low-density polyethylene, and is not accepted by UK councils for recycling. The speaker consists of three modular components that can be easily separated and melted down into new parts for future products without losing any material value. 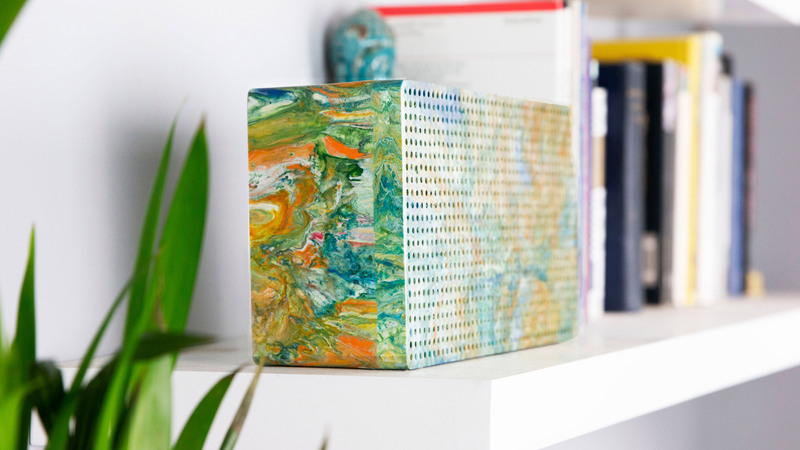 Each speaker is hand-marbled, which means that every product has its own individual aesthetic and colour pattern, depending on the particular plastic waste that has gone into it. The studio worked with local food wholesalers who typically use a large amount of packaging that is usually thrown away. “With our bluetooth speakers, we want to intercept a waste stream that would otherwise be landfilled or incinerated,” said Meades. It was important that the speaker was “not only aesthetically desirable, but also sounds great”. To achieve this, the studio worked with electronic engineers and audio professionals to hone the sound of the speaker. The studio embarked on the project after its research found that plastic waste makes up 85% cent of the pollution on beaches across the world, and that the UK throws away 300 million kilos of flexible plastic each year.